I had been very patient these past few months...sort of. Since my Integrity Toys doll dealer no longer has a front shop, I normally wait for some dolls to arrive before I go and pick them up. It's also a great time to catch up and say hello to my awesome dealer since I don't see her as often. 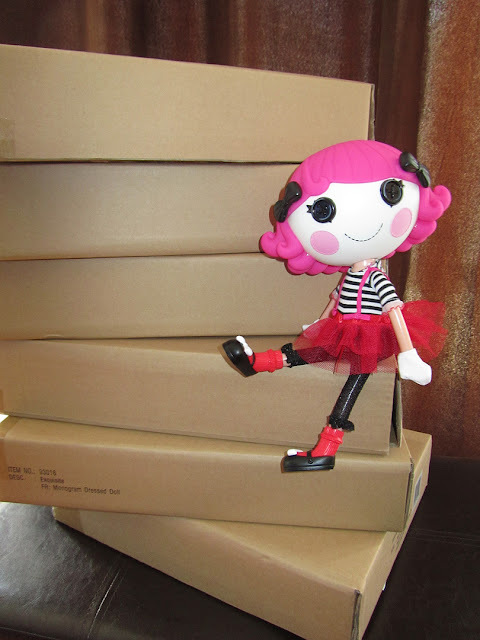 Today, I picked up my dolls and it feels like Christmas in July! Christmas in July is sort of popular in Australia because it's winter here so it's the right weather for a traditional Christmas feast. Hope you enjoy your 'presents' and we look forward to more pictures. I think the idea of Christmas in July sounds fun! I'm hoping to get pics in the next few weeks! 0_0 But... but who is in those boxes????!!!! Thank you Marta, as always! You are just so sweet! Lalaloopsy looks pretty sitting there amongst the boxes ... I bet she's curious to see what's inside. I'm totally loving this reply per post thing that I just discovered now. I hope you're starting to love your Lalaloopsy, Sandi.